If you are looking for conference PA Hire packages then look no further than Audiocrew for crystal clear spoken word reproduction. 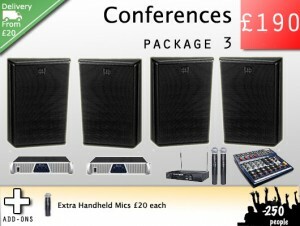 Suitable also for Speeches, Recitals, Talks and Lectures our PA systems will ensure that not a word is missed. 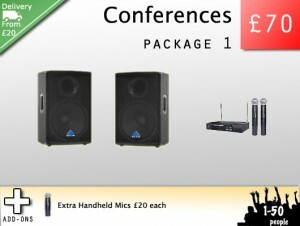 If you have background music or sound within visual presentations this too can be connected to the system, filling the room with sound and providing gravitas to your feature to wow your audience. 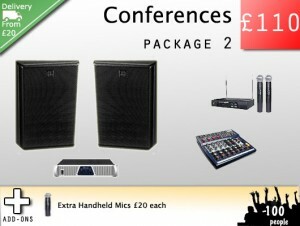 Audiocrew have years of experience in providing Conference PA hire throughout Kent, London and the UK. Our rates are extremely competitive and we are committed to providing first class service to our clients through dedication and flexibility. All of the below sound system packages can be hired for your conference with or without a fully qualified and experienced sound technician. All our personell are flexible in their approach, well presented and will be dedicated to delivering quality to your event. If you have requirements not accounted for here or you would like to discuss specifics, please contact us for free advice and a bespoke quote.